Philip S. Anderson was a founding partner of Williams & Anderson and is now senior counsel to the firm. He received his B.A. and LL.B. degrees from the University of Arkansas. He served as Editor-in-Chief of the Arkansas Law Review. He has broad experience in trial and appellate practice as well as in acquisitions, mergers and general corporate matters. He was president of the American Bar Association in 1998-1999. He continues to maintain an active practice. Mr. Anderson was selected by the Fellows of the American Bar Foundation to receive the 2013 Outstanding Service Award, which is presented to "a fellow who has , in his professional career, adhered for more than thirty years to the highest principles and traditions of the legal profession and to the service to the public." Mr. Anderson represents the Arkansas Democrat-Gazette, a newspaper of statewide circulation. He also serves on the board of directors of the newspaper and its parent company. He represents media clients on First Amendment issues, including access and defamation. He was lead counsel for ABC, CBS, CNN and NBC in access litigation arising out of the Whitewater trials in Arkansas in 1996. He has represented The New York Times, the Associated Press and HBO on media issues arising in Arkansas. He was also lead counsel in trying two landmark newspaper antitrust cases to successful conclusions. Community Publishers, Inc. v. Donrey Corp., 892 F. Supp. 1146, affirmed, Community Publishers, Inc. v. DR Partners, 139 F.3d 1180 (8th Cir. 1998); Arkansas Gazette Company v. Camden News Publishing Company, U.S.D.C. No. LR-C-84-1020 (E.D. Ark. 1986). He was retained as appellate counsel in Cooper Tire & Rubber Company v. Phillips County Circuit Court, 2011 Ark. 183, in which the Arkansas Supreme Court reversed the discovery order of the lower court and issued a Writ of Certiorari to protect the manufacturer's valuable formulas and other trade secrets from disclosure. He was lead appellate counsel in the appeal of the largest personal-injury verdict in the history of the state, which resulted in a substantial remittitur of the award, Advocat, Inc. v. Sauer, 353 Ark. 29, 111 S.W.3d 346 (2003), and in the appeal of a judgment in the amount of $8.2 million against a bank on a lender-liability claim, which resulted in the reversal of the judgment and the dismissal of the claim, First Commercial Bank v. Walker, 333 Ark. 100, 969 S.W. 2nd 146 (1998). He tries cases in federal and state courts throughout Arkansas, and appears before the United States Court of Appeals for the Eighth Circuit and the Arkansas Supreme Court. For several years, Mr. Anderson was outside general counsel for the largest bank holding company in Arkansas at the time, and he represented the client in the acquisition of banks throughout the state. He continues to represent clients in major acquisitions and mergers. In 2008, he represented WEHCO Newspapers, Inc., in the acquisition of three newspapers in central Missouri. In 1998 and 1999, he represented the same client in the acquisition of the Chattanooga Free Press and The Chattanooga Times, which papers were merged into the Chattanooga Times Free Press in 1999. 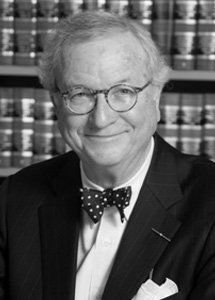 Mr. Anderson’s service to the American Bar Association, in addition to his term as president, includes two terms on the Association’s Board of Governors and more than thirty years in its House of Delegates, in which he continues to serve. He is a member of the American Law Institute, which promulgates the Restatements of the Law, and he is an emeritus member of its governing Council. He served as an adviser in the preparation of the Restatement of the Law Governing Lawyers and the Restatement of Trusts-Prudent Investor Rule. Mr. Anderson is listed in Best Lawyers in America under Antitrust Law, Appellate Practice, Corporate Law, First Amendment Law, Commercial Litigation, Bet-the-Company Litigation, Litigation - Antitrust, Litigation - Banking & Finance, and Litigation - First Amendment; in Chambers USA as a “Leader” in the field of General Commercial Litigation; and in Mid-South Super Lawyers in the areas of Business Litigation, First Amendment/Media/Advertising Law and Business/Corporate Law. Mr. Anderson is a Fellow of the American Academy of Arts & Sciences.